oh, sweet joy! : my first vlog/video tutorial! happy saturday! i have a special saturday treat for you. so grab your coffee, a headband that's layin' around and some fabric scraps & let's craft! here's a quick & easy project for you to do if you're itchin' for a new hair accessory! ps doesn't the silly face alone make you want to watch? haha why can't they pick more flattering still-shots? no sew bow headband tutorial! from kim davis on Vimeo. **edit** i totally meant topstitch, not finishing the seams haha oh geeze. Now this is more my style or should I say more my level of "sewing". Definitely going to give this a try! You're hilarious! Super cute. I'll try it today! you are too cute! 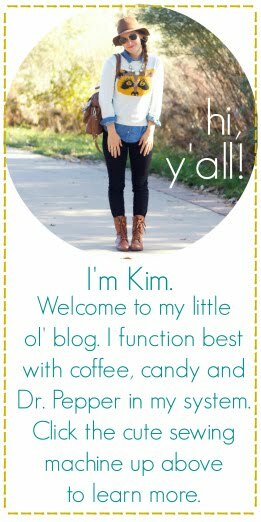 you're pretty much just how i imagined you, which means your personality shines through your blog :) what a fun little tutorial, i love bows! i second Meg. You are too cute! !